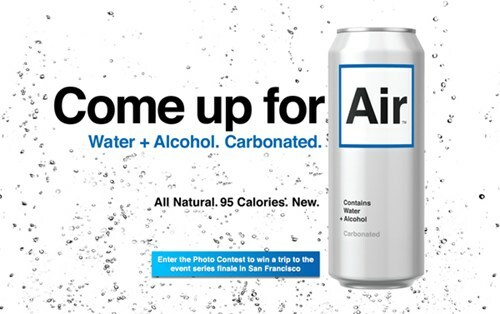 A new drink called Air: You had me at "Alcohol Inspired Refresher"
Ok, they really just had me at "alcohol inspired," but I like refreshing things, too. That's why, when I'm out on the town with my Marina Girl posse, I like to drink Vodka Sodas. They're light, refreshing (see! ), and they do the trick. Just don't forget that lime. God knows they need SOME taste in them. Enter Air. Who needs a bartender/mixologist/therapist? Just pop down to Walgreens or the corner store and pick up a six-pack (of course, they'll probably come in four-packs, so I'll have to buy two--don't tell my sponsor). Air + limes will be the new Tuesday. Cheers! Oh, you'll have to add your own vodka too. These things only pack a 4% ABV punch, and if my grandma taught me anything, it's "Don't get out of bed for anything less than 10%."